One thing I have found sometimes hard to do is to maintain a conversation with a person for an extended period. For example, whenever I meet someone new, it usually starts with common questions asking about their name, current vocation, and sometimes about their day. Then you could move into other topics like hobbies, current events, or news, depending on how much you want to talk. However, you know you are out of ideas when you start talking about the weather, or repeat items you have already mentioned previously. Unfortunately, this can also happen to people you talk to almost daily. For example, I once told Editor-in-Chief Jonathan Kwan how the only things we primarily talk about are cars, politics, and APH Networks related items. There are also the infrequent times he gives me girl advice, or relates the girl advice to either cars, politics, or APH Networks, but it mostly falls in the former three specific topics of conversation. Thankfully, we generally have quite a bit to talk about and bringing up new things, even if they are within the same topics, and that refreshes the conversation. Thus today we have a somewhat copied and pasted chassis in the form of the Fractal Design Define Nano S. It has been two months short of a year since we reviewed the Fractal Design Define S, an ATX-sized computer case, perfect for allowing airflow and water cooling options. Now today we have its smaller version in the ITX form factor. So I have to ask, other than the size, what is new? Is this literally a "Honey, I shrunk the kids" moment, or will I have more to speak about in this review? Read on to find out! Today's review unit of the Fractal Design Define Nano S arrived from the manufacturer's USA headquarters in Dallas, Texas, USA. Shipping with UPS Standard, this package arrived to our APH Networks offices here in Calgary, Alberta, Canada. As you can see from the packaging, it arrived in relatively good condition, as there are no noticeable dents or scratches. 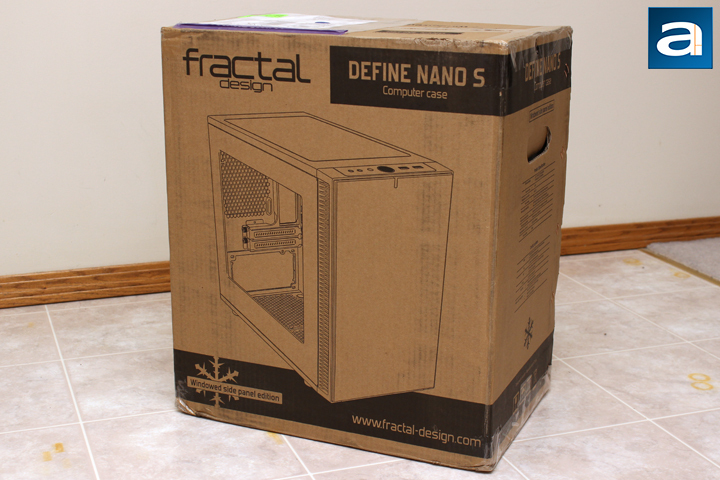 The retail container itself is a standard state of affairs, using the same brown corrugated cardboard box we have seen from Fractal Design in the past. 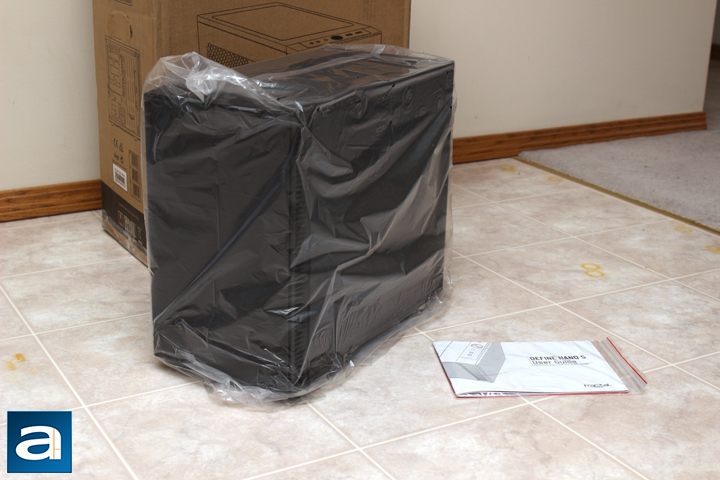 Out of the box, we have the Define Nano S wrapped in a plastic bag, and held between two large foam brackets. The bag itself is good in preventing any surface scratches during shipping. The foam brackets also help in preventing any damage should anything happen during movement. Furthermore, the window on the side is covered in plastic on both sides to ensure there are no scratches on the plastic window. Otherwise, we have a small installation manual explaining how to install your parts into the case. Fractal Design is one of the better manufacturers in providing clear and concise instructions, but of course, you readers are probably more interested in the case, so we will throw aside all these other things, and take a closer look at the Fractal Design Define Nano S.
A small white cardboard accessory box is found inside the case, and you can see all the different screws and other mounting accessories here. There are four bags of screws, used for mounting the motherboard, power supply, and storage drives. We have a PWM fan header splitter, which is helpful, since mini ITX motherboards are generally limited in their fan headers. 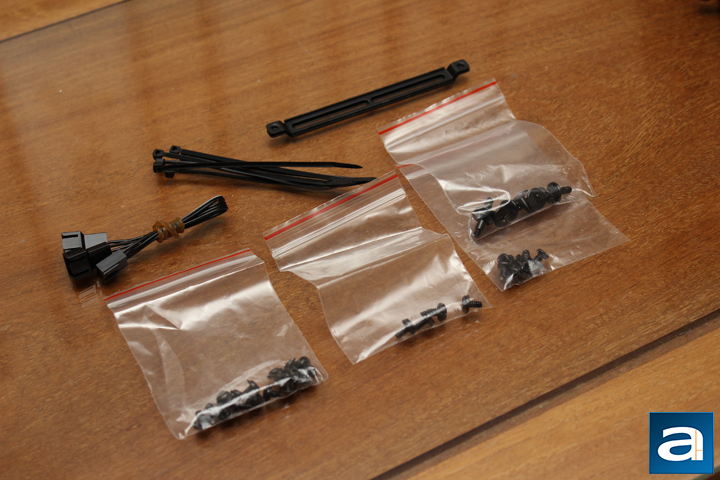 Next to it is a few small black zip-ties to help with cable management, and finally there are two mounting brackets, which is used for mounting different water cooling components.